Our uPVC conservatories have a high level of security built in as standard. You can check our Locks and security page for further information. uPVC requires very little maintenance. It is far easier to clean and will not rust, corrode or warp from the outside, like some other materials can. Soap and water is good enough to use when cleaning, retaining its good looks. Your conservatory will come with a ten year Guarantee but can last longer than this as uPVC is good at weathering the elements. Other material can be affected by the weather, like wood, but uPVC is very durable. The cleaning of both gaskets and profile sections should be carried out periodically to maintain the appearance. Failure to do this will not affect the performance of the products. but will spoil their appearance. Stains that are not removable with soapy water may be removable using a domestic non-abrasive cream cleaner. However, these should not be used to excess as they may affect the gloss finish. For PVC-U products with decorative finishes e.g. woodgrain. the suppliers advice should be sought as to which products are suitable for attempting to remove stubborn stains. On no account should any solvent-based cleaners be used without prior approval from the supplier. as some of these may seriously affect the profiles. PVC-U profiles never need painting. Should painting or re-painting be desirable then this should only be undertaken by suitably qualified companies. The use of the wrong type of paint may seriously damage the profiles. During routine cleaning it is advisable to check for damage such as scratches. abrasions. signs of tampering. faulty operation of hardware and that drainage channels are clear. Should any damage be found it is advisable to seek advice from the supplier. or another suitably qualified company. The hardware used in PVC-U products is likely to require some simple lubrication during its lifetime. The supplier should give information as to the lubrication points and an advised frequency. Following these recommendations will ensure that the product continues to operate smoothly and efficiently. It is likely that the PVC-U frame will outlast all the other components such as double glazed units, hardware and gaskets. All these items can be replaced by experienced personnel. If a PVC-LT frame is scratched or damaged in an unsightly position it may be possible to effect a repair. In these cases it is advisable to contact the supplier. You can choose a great style for your new conservatory by opting to use uPVC, as there are a wide variety of shapes and styles available. These include Edwardian, Victorian, and Gable conservatories. uPVC is a very popular choice for homeowners who want to add value to their property or just to improve the look of their home. You can add blinds for privacy and furniture to make your room have an added style. Adding a uPVC conservatory to your home can add that extra living space, whether it be for a playroom for the children or a room for winding down in, for a reasonable cost that will add value to your property. You can save on heating bills due to uPVC having great insulating properties. Your conservatory can last a lot longer than the guaranteed ten years, if it is maintained well. Just some of the reasons to opt for a uPVC conservatory or extension through Bahama!!!! 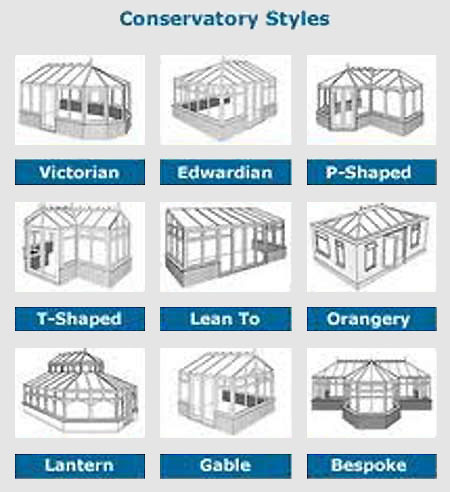 Please look through our pages of styles available or contact a member of our team on 01494 444666 if you have any queries on choosing a conservatory to suit you and/or to make an appointment.